The front door of Crown Court Church stands next to the Fortune Theatre and is opposite the west side of the Theatre Royal (Drury Lane). 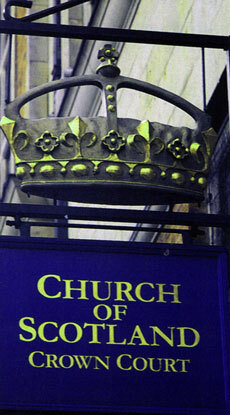 The Church was the Kirk of the of the Crown of Scotland when the two countries were independent and Scotland had a diplomatic presence in the Metropolis. The Courtyard alleyway itself runs parallel with Bow Street, London WC2 and the edifice of the church is best seen from the pathway of Crown Couirt where the back door to the vestry and lower hall is situated. The nearest underground tube stations are HOLBORN, COVENT GARDEN and LEICESTER SQUARE with Covent Garden, if open, being the most convenient to the church.Inasmuch as the public underground of London Transport is concerned, any bus route which skirts round The Aldwych such as Nos. 6, 9, 11, 13, 15, 23 - a ten minute walk away from the church - is reasonably convenient. Private car-parking spaces are very difficult to locate anywhere near the church so that attendees who journey to central Londonfor the service tend to leave their own cars at their "home station" and travel in by public transport.